With our available seating area you can utilize the kitchen at Square One to create a delicious meal and then enjoy it together in our event center. 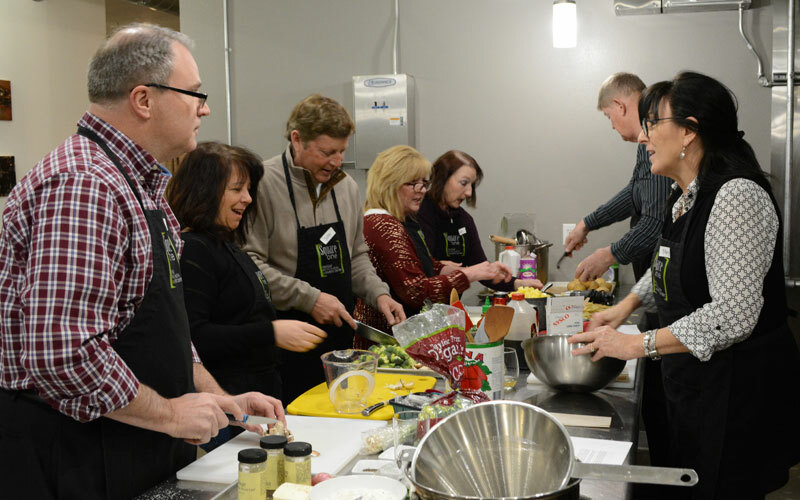 We have different options available and can accommodate groups of 6 up to 25 participants for private cooking classes and events led by our culinary instructors! Larger groups can be accommodated. Please email us for more information at info@squareonekitchens.com. Our facility is also available for private events where you can cook your meal at Square One and utilize our seating area on your own. Perfect for rehearsal dinners! Facility rentals include access to the kitchens so you can prepare your own food right on site. Looking for something new and fun to do with your clients, employees or co-workers? Give us a call or send us an email to see all our wonderful private class options including team building events!. It’s not only a good time, it’s a delicious time! 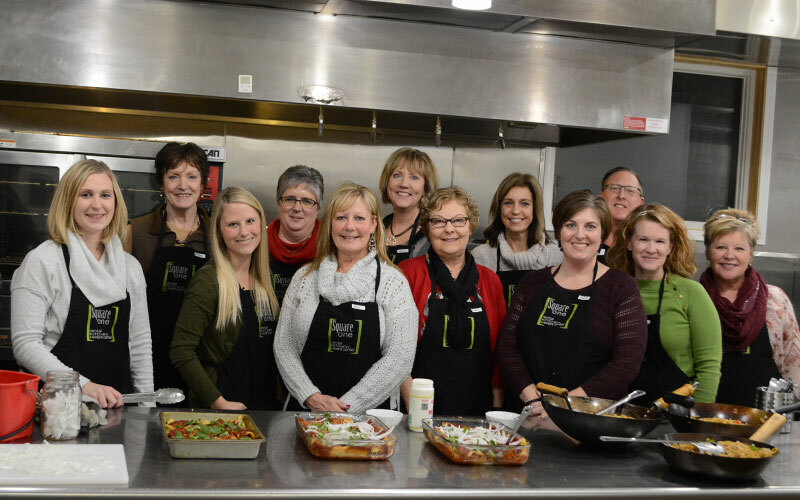 Cooking together is a great way to socialize while working together to create a meal. In our team building workshops your crew will be placed on teams and each team will be responsible for one of the meal’s courses. You will work together to create a delicious meal and then enjoy it in the seating area at Square One. We have different menu options and can accommodate various group sizes as well as dietary restrictions. Check out our Team Building page for more information. Or call or email – we’re always happy to answer any questions you may have. All dates are first come, first serve. In order to reserve the event center, the kitchens or the facility a credit card is required and a 50% non refundable deposit is required. Get our entire facility all to yourself! Please call or email today to schedule a tour and learn more about hosting an event at Square One. Sign up for our newsletter to get updates on Square One events and upcoming classes!